This article about bad credit card debt was submitted by an anonymous site visitor who wanted to share his experience and advice on how to stop accumulating unmanageable card debt. For many years, I've lived with the burden of having excessive card debt. I've learned some things along the way and wanted to share my tips on how I was able to finally bring my spending habits under control. Always take your credit card and your debit card (or checkbook, if you prefer) with you, every time you go out to purchase something. Every time you decide to make a purchase, ask yourself this question: Is this a necessary expense to carry on with my living? For example, groceries and gas fall under necessities. Assuming you can afford your necessities comfortably within your monthly income, go ahead and use your credit card to make that purchase. And come the end of the month? Remember to pay your credit card bill in full not just the monthly payment. If all you charge are necessities, this should be doable. What if this expense is more of a little indulgence like that dinner or movie out — the kind of treat that we all need from time to time? These small indulgences are the kind of purchases that can easily pile up over time into a mountain of bad card credit debt, and blow you over while piling on the high interest rates. Ask yourself if you can afford to pay for each indulgence with your income this month. If you feel you can pay for it, go ahead and make that purchase using your debit card, or write a check. Even better, use cash instead. Cash pinches it a little more than a credit card does, and you will automatically be a bit more cautious when you feel the need to make a purchase with similar purpose, again in the same month. What if you want to make a slightly bigger purchase – like a new item of furniture that you really can't afford with your current month's income? Simply, don't make that purchase right away. Don't begin to build up bad credit card debt that you can't repay. Instead, try to set aside a bit of money from each paycheck, with this specific item in mind. Do this every month, until you have accumulated enough to be able to walk into that store, and pay for that item in cash. You will notice that paying it this way takes the burden off of that purchase, and you will find that you will enjoy owning that item that much more. 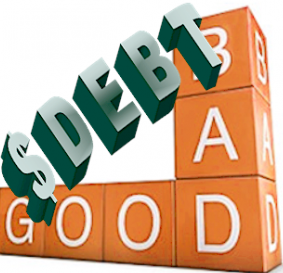 Make this way of spending a regular habit to avoid bad credit card debt. It will not only help you develop good credit over time, but also let you enjoy special things from time to time. Of course, for your long-term financial health, nothing beats planning and having a regular budget, and sticking to it.